Last week a blog post at Forbes on Wi-Fi devices went viral. 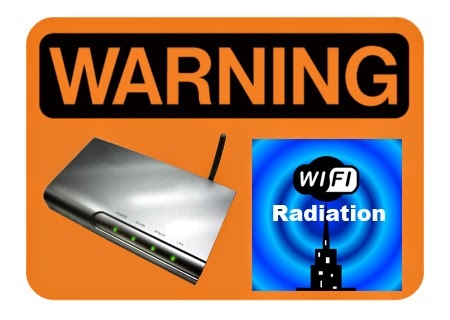 That post, by fellow Forbes contributor Robert Szczerba, claimed that Wi-Fi exposures from cell phones, iPads, microwave ovens, and other mobile devices are "more dangerous to kids than previously thought." Szczerba claimed that Wi-Fi devices might be causing cancer, especially in children." It was illustrated with a photo of a toddler playing with a tablet PC, possibly an iPad. Well, that got some attention. The problem is, it's all wrong. Even the premise is wrong: there was no "previous" evidence of danger from Wi-Fi devices, except from conspiracy theorists. Let's start where Szczerba started: he based his article on a newpaper published in the Journal of Microscopy and Ultrastructure, titled "Why children absorb more microwave radiation than adults: The consequences." I read the article, painful though it was, to see what it actually claims. The first red flag is that it appeared in a very obscure journal that does not focus on radiation or environmental health. The second red flag is that two of the authors, Lloyd Morgan and Devra Davis, work for a private organization whose sole purpose seems to be to promote claims that cellphones and other wi-fi devices cause cancer. The remaining author, Santosh Kesari, seems to be a respectable neuroscientist at UC San Diego. I wrote to Kesari to ask for comment, but he did not respond. Now to the article itself I have to say that this is perhaps the worst scientific paper I have read in years–and I read a lot. It purports to be a review of some sort on microwave radiation (MWR) exposure in children. It is nothing of the sort. It's not even written like a scientific paper. "In 2008 Joe Wiart, a senior researcher for French telecom and Orange reported that the brain tissue of children absorbed about two times more MWR than adults' brain tissue." That's it: just one sentence, with no explanation of what the study was about (nor of what "Orange" is here). It turns out to be a simulation study with little or no relevance to the health risks of MWR on actual people. Other cherry-picked examples in this so-called review include a 1972 study of myelin degeneration in guinea pigs and a 1977 study in rats, neither of which tell us anything about the risks of wi-fi devices. This paper is a dreadful mess. "The Australian study reported, "an overall significant increase in primary malignant brain tumors was observed over the study period from 2000 to 2008." This study does indeed exist, but it has nothing to do with wi-fi or microwaves! It's a study of changing cancer rates in Australia, and the authors don't even mention wi-fi, much less suggest that it causes cancer. In a real journal, peer reviewers would have insisted that the studies cited have some relevance to the main topic of the paper. Not here, apparently. I don't have time to debunk all the nonsense in this truly awful paper - nor should you want to read about it. My guess is that the Journal of Microscopy and Ultrastructure will publish anything as long as the authors pay the publication fees. In its entire history, the journal has only published 6 issues. "The overwhelming consensus of health agencies around the world is that RF [radio frequency] exposures below international exposure limits have not been shown to produce any health hazard (Verschaeve 2012). That conclusion would not be changed by the Wi-Fi–related studies reviewed here, some of which indeed were already considered in these expert reviews." Or to put it in simpler terms: Wi-Fi is not more dangerous than previously thought, and your iPad is not going to give your kids cancer. That's what Robert Szczerba should have written, if he'd looked at the real science instead of one really bad paper. But that wouldn't have gone viral, would it? Not that this defends the study in any way (which is even worse than anti-GMO nonsense), but Orange presumably refers to the UK cell phone provider of that name. I was wondering if you could comment on these videos where Prof. Martin Pall talks about EMFs causing biological effects via activation of VGCCs. I try to keep an open mind, but having grown up in an era where mobile phones, wifi and other wireless devices have become extremely prevalent and inescapable, I can't help but be scared whenever I read about all these studies that apparently confirm the dangers. It's impossible to know who to trust with talk of certain scientists and agencies having secret agendas on both sides. As much as I'd like to believe that everything you're saying is true to put my mind at rest, I can't help but worry otherwise. Anonymous: I don't comment on YouTube videos or website claims, which don't serve as evidence of anything. Any idiot (pardon my bluntness) can go on YouTube and make wacky claims, and many people have. Martin Paul is a retired professor from Washington State who seems to have lots of time on his hands, but who doesn't have any credibility on this issue. There are been hundreds of studies on the effects of wifi and microwaves on human health, the the overwhelming consensus is that they are safe. It makes sense that they are - otherwise we'd all be dropping like flies with all the devices around us. Sorry to ask you questions like this, since I know it's unlikely we'll have any 100% conclusive answers for a long time... And that's what worries me, that if that chance that EMFs do cause long-term damage turns out to be real, it'll be too late.